This classic parenting book has been revised and updated for today's parent. "In these confusing days of competing ideas, any book on parenting espousing common sense is worthy of public consumption. 100 Things I Wish I Knew In My Baby's First Year is one of those books. Clear, concise and rich with ideas." 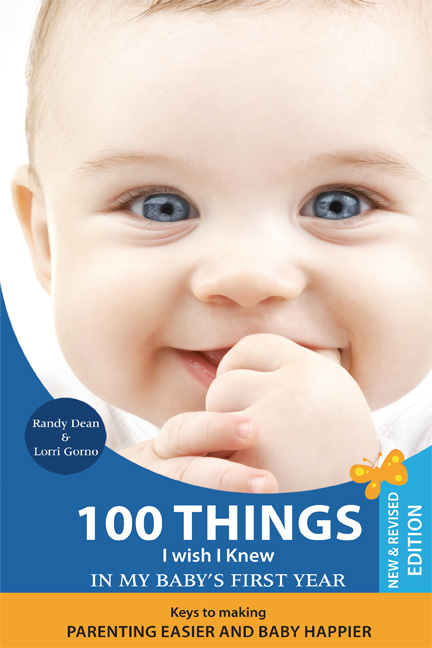 100 Things I Wish I Knew in My Baby’s First Year is an easy to read parenting resource that addresses key challenges and questions that new parents will face in their baby’s first year. The information included in the book is based on the most frequently expressed concerns of new parents, extensive research, and personal experience. This book is arranged into 100 stand-alone topics. This format makes the book easy to read and lends itself well to time-constrained new parents or parents to be. Thoroughly researched and endorsed by leading child care experts, this book includes a large amount of information condensed into a short, easy-to-read format; real world advice that is thoroughly researched; with a parent-to-parent perspective that new parents will appreciate. "This collection of notes from two experienced parents (Dean and Gorno have three children together) does not have an expert’s stamp of approval, but that doesn’t mean that its advice isn’t valuable. The book might be best used as a supplement to the numerous—and important—guides on parenting from physicians and other credible sources. Dean and Gorno (who work in sales/marketing and healthcare, respectively) cover everything from the joys of jogging with your baby, to letting your baby cry her or himself to sleep, to teething, to eliminating pacifiers. Most topics get one page, and Dean and Gorno employ the "we" perspective quite often. A considerable amount of their advice addresses partner relationship issues, such as what to do when parents have conflicting views on childrearing. Although this should by no means serve as a parent’s only guide to raising a child—lines like "recent research shows" mingle with more credible sourcing—it’s a personable book that could quell new parent anxiety." "This manual is filled with many tips that a seasoned parent may take for granted but that we all had to learn when we were first timers. In addition, there are ideas that are born of a child rearing philosophy that respects the unfolding of a natural process of development and educates parents about fostering it." "Wide-ranging, practical suggestions for new parents, backed up by research. This book will help parents have confidence in their ability to take great care of their babies." “I was very impressed by how most of what you wrote matched exactly what I say, or would like to say, to parents. I found myself turning over page corners for each piece of advice that I thought was great but I stopped doing that since I had turned over most of the pages. Some of what you wrote was so perfect it made me say "great advice" out loud or write "great tip" on the page. I feel what you said was right on the money. There are so many pieces of advice out there, and you captured most if not all of the important ones. This book would alleviate at least half of the preventative advice I try to give expectant and new parents. Common sense and being realistic are part of my approach and obviously part of yours. I find that nothing replaces common sense personal experience when it comes to parenting and your experience has paid off. From the tips on diaper rash, burping, feeding issues, gas, teething—all real advice for real parental issues. I could go on and on but that would be a summary of your book.